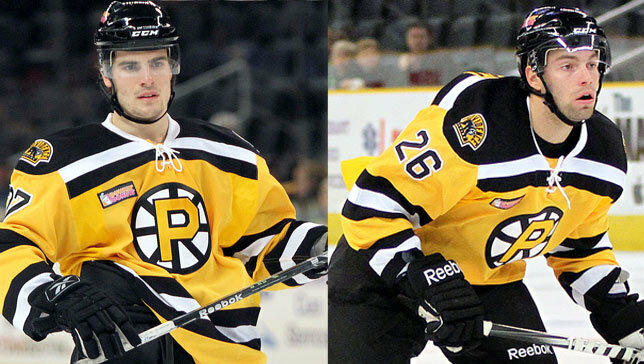 The New York Islanders officially announced that they have acquired Marc Cantin and Yannick Riendeau from the Boston Bruins in exchange for Brian Rolston and Mike Mottau. Both Riendeau and Cantin have been assigned to the Islanders American Hockey League affiliate, the Bridgeport Sound Tigers. Marc Cantin (left) and Yannick Riendeau were traded to the Islanders on Monday. Cantin, a 6’1, 192-pound defenseman, has split the 2011-12 season between Boston’s AHL affiliate, the Providence Bruins, and the Reading Royals (ECHL). With the Royals, the Omemee, ON native has six points (one goal and five assists) in 16 games. In 19 games with Providence, Cantin compiled 22 penalty minutes. Prior to this season, Cantin played five seasons in the Ontario Hockey League, splitting time with the Belleville Bulls, Windsor Spitfires and the Mississauga St. Michael’s Majors. At the completion of his junior hockey career, he had played in 249 games and compiled 16 goals and 64 assists for 70 points. Riendeau, a native of Boucherville, PQ, has played in 46 games for Providence over the course of the last three seasons, accumulating four goals and seven assists in 46 games. He’s also spent time throughout the last three seasons in Reading, totaling 77 points (30 goals and 47 assists). The 5’10, 178 pound right wing played five seasons in the Quebec Major Junior Hockey League with the Rouyn-Noranda Huskies and the Drummondville Voltigeurs. He scored a total of 337 points (150 goals and 187 assists). In his two seasons with the Islanders, Mottau had five assists in 49 games. Rolston, acquired in exchange for Trent Hunter on July 28, played in 49 games for the Islanders this season, scoring four goals and five assists for nine points.